I’ve only had two jobs in my entire life, and Dennis Green got me both of them. He got me my first job when I was just a teenager. My dad first met Coach Green when he was the coach at Northwestern, and they developed a close friendship over the years. After he took over as coach of the Vikings, my dad hosted and produced Coach Green’s weekly radio show. I first met him when I was nine years old, and he became sort of an uncle to me. One day I worked up the courage to ask him if I could be a ball boy for the Vikings, and I remember that he said “Absolutely!” But he let me know that he wasn’t going to go easy on me just because we were friends. He said I’d need to dedicate myself fully to the job and not take any shortcuts. And he meant it. While I was a ball boy with the team, Coach Green showed me firsthand what it meant to be a professional. He gave me more and more responsibility over time — letting me do things that might seem small now, like spotting the ball during practice, but at the time I took them really seriously. I couldn’t have had a better role model at that age. When I met Coach Green, I was a young man with a lot of hopes and aspirations. What he gave me was belief. The first word that comes to mind when I think of my relationship with him is proud. I’m incredibly proud that such a special and important person played a pivotal role in my life. When I look back on his legacy, I don’t think about any individual play, game or postgame press conference. Instead, I think of him as a trailblazer. You’re talking about somebody who was the first African-American head coach at Northwestern and Stanford, two of the finest educational institutions in the country. This was an intelligent, compassionate and astute man. But for all of his own accomplishments, he always wanted to make those around him better. He was somebody I looked up to and respected so much. And when a person like that, someone who you hold up so high, shows belief in you, it makes you feel invincible. When it came time for me to choose a college, I confided in Coach Green. When my mom passed away, he was one of first people to call me. He never considered himself too important or too busy to pick up the phone and provide some wisdom. He had this special gift for guiding and molding young men, and football happened to be the way he shared it. That was Coach Green in 2004, giving me my second job. I remember when I found out that I had been drafted by the Cardinals, I was over the moon. It was one of those things you never forget. But I also remember that after that initial wave of excitement wore off, I felt a lot of stress. Because I knew that I wasn’t just another player that the Cardinals were taking a chance on. I knew Coach had a big hand in having the team draft me with the No. 3 pick when they could have taken guys like Ben Roethlisberger or Philip Rivers. The Cardinals already had a young Pro Bowl receiver in Anquan Boldin. Wide receiver wasn’t a need position for them. So my emotions went from joy to feeling a lot of pressure. I didn’t want to let Coach Green down. I knew I had to go out there and perform well so people would know that he had done that he did a good job evaluating me. All I wanted was to do right by him. I think one of the reasons it felt so good to have Coach Green draft me was because I knew he had a tremendous eye for talent. He didn’t just look at you as a football player — he really tried to understand the guys he coached. In my draft year alone, he also picked Karlos Dansby, Darnell Dockett and Antonio Smith. All four of us were on the Cardinals team that represented the NFC in the Super Bowl in 2009, and all played 11-plus years in the league, which is three times the average career span. 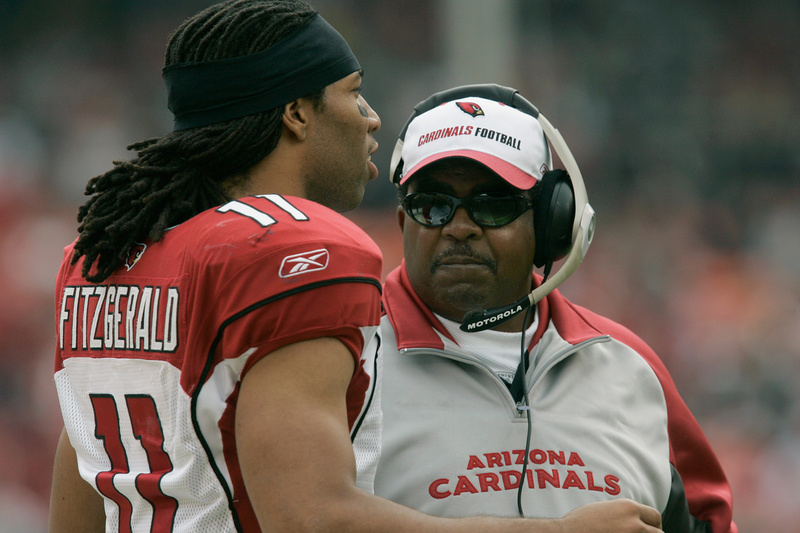 Coach Green believed in second chances, and often gave opportunities to guys later in their careers when they were in transition from their previous teams – players like Randall Cunningham, Warren Moon, Kurt Warner and Bertrand Berry, who all demonstrate they were still capable of playing at an elite level. And he was extremely detailed, emphasizing the little things and providing small bits of advice that are still relevant to my career to this day. In a sport that is all about exploiting flaws, Coach Green was always able to see the best in people. But for all of his success as a coach and mentor, perhaps his greatest legacy is his beautiful family. Right now my thoughts are with his wife Marie, daughter Vanessa and son Zachary. If you were ever fortunate enough to spend time around the people closest to him, you got a very good idea of the kind of man he was. Of all the great memories I have of Coach Green, the one that sticks out the most has nothing to do with football. It was a few years back, when he came to visit my family and bought me my first tackle box. It was gorgeous outside, and I remember we went out on the lake together with my son Devin, and for an entire afternoon we just fished, laughed and enjoyed each other’s company. It was a day that I will never forget. That’s the Dennis Green I’ll always remember.